Winter is the Most Wonderful Time of the Year in the Everglades | Everglades | Oh, Ranger! As most of the country gears up for snowy days and hot chocolate-filled nights, Everglades National Park is getting ready for its biggest season of the year, Winter. As one of only a handful of subtropical parks in North America the Everglades boasts balmy weather, beautiful scenery and diverse wildlife. Today the nearly 1.5 million acres that make up Everglades National Park is only about a fifth of the original size of the vast wetland system of southern Florida. The area was deemed a national park in 1947 to protect its fragile and diverse ecosystem. Since that time, the park’s significance has grown. It is now recognized as a World Heritage Site, an International Biosphere Reserve and a Wetland of International Importance. During the winter months park visitors can enjoy a wide range of activities as diverse as the plants and animals that inhabit the park. Birdwatching is an absolute must. Rare birds like the great egret, snowy egret and roseate spoonbill all call the Everglades home. The endangered wood stork, the only stork native to North America can also be found here. During the winter months several species of birds make there way to the Everglades to escape the cold. If birdwatching is not your cup of tea, the southern end of the park is where you will find the Everglades’ larger inhabitants. It is here, where fresh water from Lake Okeechobee meets salt water from the ocean, that crocodiles, alligators, sea turtles and manatees thrive. If you want to get of your feet, biking and canoeing are excellent ways to take in the Everglades landscape. Bicycles can be rented year round at the Shark Valley Visitor Plaza. Canoes are also available for rent at the Gulf Coast Visitor Center. The park offers ranger-guided canoe tours that can help you get a better understanding of the importance of this great river of grass. For more information call (239) 695-3101. The Everglades also boasts tram tours. These two-hour guided tours are a great way to see the park on a tight schedule. Fishing is a popular activity in the park, where snapper, sea trout, redfish, bass, bluegill, tarpon and snook are plentiful. Please remember that separate Florida fishing licenses are required for freshwater and saltwater fishing. New this year, the Everglades now offers a variety of podcasts to help visitors plan their trip. These podcasts are perfect for younger audience, and range in subject from the wood stork, to information on the park’s waterways. They are a great way to stay up to date with all that’s happening in and around the Everglades. With the wide range of activities available, the Everglades offer a welcome escape from the cold grasp of winter. The dry season affords visitors many opportunities that aren’t available during the flooded summer months. To plan your trip or to get more information visit our Everglades page. 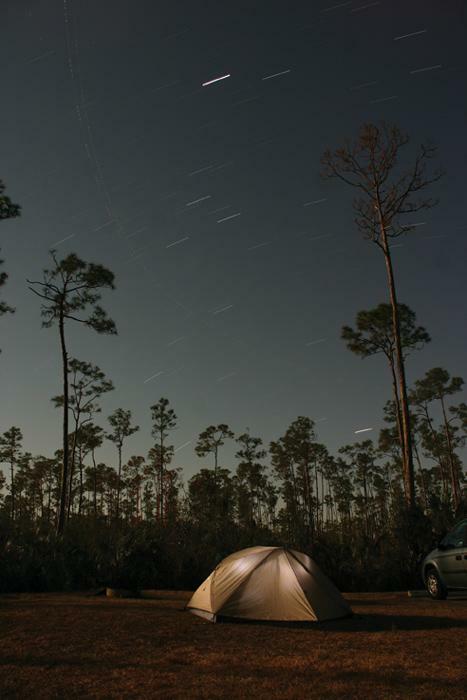 Image: Camping in the pinelands at Everglades National Park. Photo by Larsek. Source: OhRanger.com.